A group of courageous young ladies faced off at the 2016 P.I. Contest in Weatherford last week. 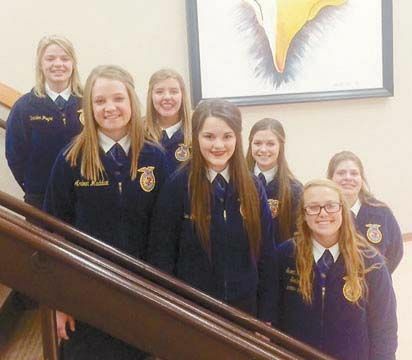 Their placings were: 1st in 9th Grade Opportunities and 2nd in Creed was Dixie Boyce-Smith; 1st in AG Policy was Hadley Smith; 1st in AG Business was Braden Payne; 3rd in Agriscience was Sarah Haven; 3rd in Plant Science was Claire Kerr; 4th in Animal Science was Andrea Maddux and 6th in Creed was Mackenzie Payne. Congratulations to all these young ladies for their hard work.